One question I have is at what point (# of units) do you reach economies of scale, bringing down the cost per unit? That is an excellent question and it’s very hard to answer. I do know that the hard costs per square foot of a concrete building at some size become cheaper than a wood building. Also, with extremely repetitive units costs become lower for things like cabinetry and fixtures. Many of the other costs like fees etc. don’t really come down with economies of scale, and often go up because larger projects are more difficult to get approved. Hi Mark, thanks for writing something about this. I feel like it’s a hugely important question that gets at the *cause* of SF’s affordability crisis, and one that usually gets ignored in favor of heated debates about symptoms like “techies”, Google buses, etc. In addition to the things you mentioned above as possible ways to reduce the cost of these new units, what about increasing density? Both in terms of covering more ground or building higher and decreasing unit size. Though 800 square feet per unit is not huge, it is probably much larger than it needs to be in a city like San Francisco, where there is a vibrant collection of civic and entertainment venues and a culture and climate that facilitates and encourages their use. Particularly as family sizes decrease and the number of singles increases, making more compact units the norm would make a lot of sense, no? Just look at how much great functionality IKEA is able to fit into one of their mocked up sample “apartments” of only ~375 square feet! Terrific post. It takes a very complicated issue and strips it down to its most salient, and most misunderstood, elements. Great article Mark. One thing, if the 800 Square foot is cost for the building overall the apartment size you are talking about is more like $640, Excluding corridors, stairs, etc. Excellent point. In the quest to make things as simple as possible I left out the efficiency of the building as part of the calculation, but it’s obviously a big factor in the cost. Just curious – why are the things that contribute to the quality of the city – such as design review, community process and affordable housing fees thought to be a “burden” on new development, but land costs that have risen at unprecedented rates in the last several years are thought to be an indisputable, market driven, unchangeable input? Aren’t land costs defined by development potential? Shouldn’t developers in SF anticipate all these costs (inclusionary and processing costs) and negotiate lower land costs? Developers do anticipate these costs when assembling a proforma for the project. I don’t think I used the word “burden” anywhere, but they have to be acknowledged in this calculation. I should also point out that San Francisco has the most notoriously difficult to negotiate planning process of any large city in the US and the costs are higher as a result, both for affordable housing and market rate. Real estate is priced based on development potential- the height limits and possible density are taken into account and the land is priced accordingly. In the current market developers have no ability to negotiate land prices down, in many cases the land is bid up above the asking price (similar to the current market for single family homes). You have combined city fees with “professional service fees” (presumaby, architect, engineers, etc) at 20%. What is the breakdown? How much could reducing the review times realistically reduce the project cost? More importantly, how much would any reduction realistically be reflected in the sale/rental cost? Are developers not getting sales prices and rents that the market can absorb, no matter the cost (assuming developer profit)? I grouped all of this together because the professional services fees are related to the amount of time it takes to get approved, as the fee for the entitlements phase is often on a time and materials basis (at least for the architects). All of this depends on the specifics of the project. It also depends on how many consultants the developer may need to employ (or in the case of 8 Washington, whether a political campaign needs to be waged). I put 20% in as a conservative figure, I have heard much higher figures from developers in the past (as much as $90-$100k per unit). The main reduction in cost would be from the reduction of time in moving a project to completion. If the approvals process ends up taking two years, the cost of carrying the land and the escalation in construction costs drive the overall price of the project up further over that two year wait. Many other cities make it easier for permits to be granted over the counter (as I’m sure you know). This was the topic of a recent forum at SPUR. 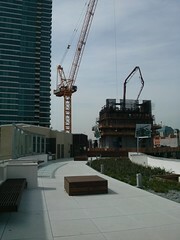 Developers are clearly getting the prices/rents the market will absorb. However, I was trying to illustrate the minimum housing could be built for under the current system as a way of showing that even when profit is taken out of the equation a typical new built unit is still above the budget of the average San Franciscan. These high costs also make housing construction less likely when the market is less than booming, because projects stop penciling out. If you have any other feedback I would love to hear it. So the delta between $460k construction cost and $800k – $1.2M asking price for these units is the developer’s overhead and profit, or am I missing something? Innovative cost-saving measures to make cheaper buildings serves the profit margin, but how does cheaper construction help build better cities, or even lower housing costs when demand is so high? All this assumes development by the private sector. Why ignore the fact that only the people can solve the peoples problems, and that is done through the institution of the people “government”. To expect private for profit companies to act in any way that helps slow the market rate cost of housing is deluded. However the city has the ability to not only streamline the development process, thus bring down cost, has land that can be re purposed, and can build on a much larger scale, further reducing per unit cost. The only thing lacking is the political will of the people to elect a government that is not corrupt, and in the pocket of those who profit most from maintaining the status quo. Next Next post: How can we build cheaper urban housing?